Journalists, we need to talk more about the “why” of what we do. What does the profession exist to do? Who do we serve? Why are we doing this story or covering this issue? These questions do not have simple answers, of course. We’re motivated to different degrees by a variety of things like community service, holding the powerful accountable, righting societal wrongs and providing information the public needs. We’re also motivated by factors like website traffic, job security, personal reputation, scooping the competition and the financial health of our organizations. These and other factors manifest differently for different journalists, different newsrooms, different coverage goals and different companies. Something we do know from our Trusting News interviews is that too many people think journalism is motivated primarily by personal agendas and a desire to make money. The only surprising thing about that is how little we’re doing to set the record straight. Mission-driven journalists need to be clear about our purpose. There’s a storytelling void about what motivates journalism and how journalism works. We need to fill it with clear, accessible, relevant, compelling information. Service-oriented journalists also need to recognize that our values aren’t universal. There’s a lot of irresponsible work done in the name of journalism. Please, let’s acknowledge that, stop defending the whole industry and start helping news consumers make smarter decisions about what to trust. There are a lot of connections between our Trusting News work on what motivates journalism and other recent research reports. In this post, we’ll share highlights from other important work then show how we’re addressing it in our own. The Membership Puzzle Project addresses how a perceived unselfishness of workers affects public perception of their trustworthiness. A report from The 32 Percent Project report describes a “shared mission” people say they’re looking for from news. An American Press Institute survey sheds light on what people think motivates journalism. And our Trusting News work shows examples of how newsrooms can share the “why” of their work as part of their day-to-day storytelling. The recent Knight Media Forum heard that there seems to be a connection between trust and occupations commonly seen as “selfless”: people trust professions more where they perceive there is no real personal gain for the individual such as librarians, nurses, and soldiers fighting for their countries. A lot of journalists get into this business because they believe access to credible information is a basic human need. Being a journalist helps us feel like we’re making a difference in the world. That of course doesn’t mean we’re divorced from goals that benefit us personally — or that benefit our organizations more than they benefit society. But the basic principle of service is a driving force behind why we come to work every day. … if we want to see an increase in public trust in media journalists need to find a way to overtly demonstrate the public service nature of their work which overrides the perception that they are serving the commercial needs of their organization, or their own professional advancement. This will mean working hard to divorce newsgathering processes from commercial imperatives (either real or perceived); and distancing journalism from the political elite — or better still, proving that journalists really are providing a watching eye on the political elite, rather than “performing” democracy in cahoots with them. For The 32 Percent Project at the Agora Journalism Center, Lisa Heyamoto and Todd Milbourn held workshops with news consumers in four cities to talk about what strengthens and weakens trust. They found six themes, one of which was a shared mission. Participants expressed a strong desire to engage with news organizations that share their goals and aspirations for the community. In many cases, participants viewed today’s news organizations as little more than profit-seekers who were willing to pursue sensational or misguided stories as a way to drive advertising. Critical to building trust, participants said, is creating a sense that a news organization shares bedrock values and is invested in the good of the community. As with many of the strategies we’re proposing through Trusting News, this can seem obvious. It’s also hard to disagree with. Most journalists would say they have a community’s interests at heart. But if our communities aren’t recognizing it, we’re clearly not telling our own story very well. Keep reading. Although the public feels somewhat lukewarm toward journalists and also sees problems of misinformation, they are not entirely cynical about journalists’ motivations. 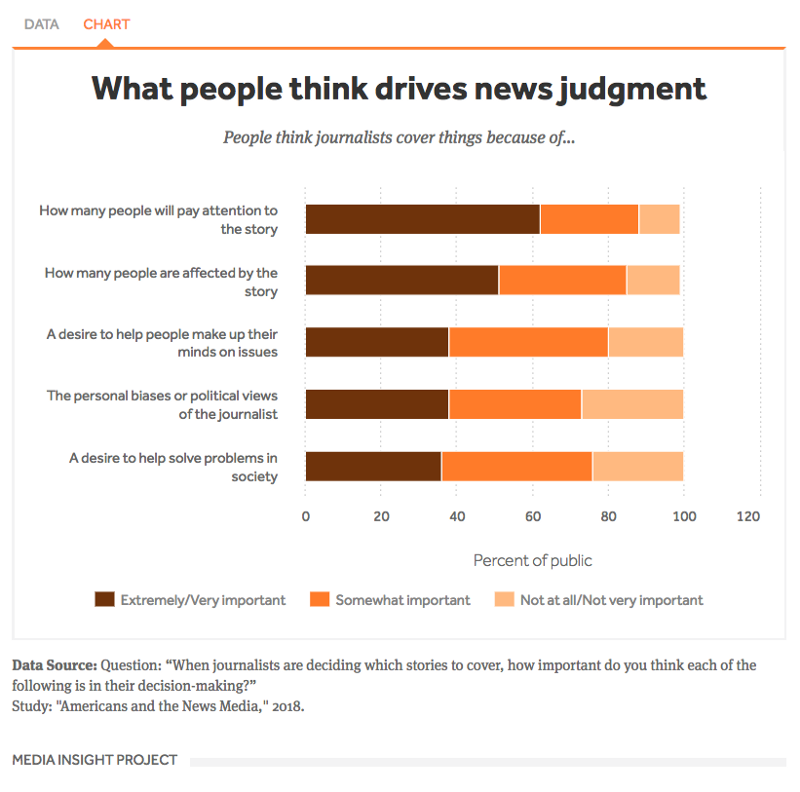 When it comes to what’s important when journalists decide which stories to cover, majorities say that journalists do care about how many people will pay attention to the story (62 percent) but also about how many people will be affected by it (51 percent). So only about half of Americans think journalists place a high value on covering stories that affect a significant number of people’s lives. Here’s the full chart. Our partner newsrooms have been looking for opportunities to inject some “why” into their work. That has manifested in ways big and small. Journalists at WCPO have a knack for anticipating what complaints or backlash they might receive and getting in front of it. When their investigative team launched a series on police accountability, the newsroom produced a web story and an on-air story designed to explain why they’d invested so many resources in this specific topic. One of our most important roles at WCPO is to look out for you. We take seriously our job as a watchdog on those with power, especially in government. And we also find out if people in power are being held accountable, if the systems of governments and law enforcement are working fairly like they should. That’s why chief investigative reporter Craig Cheatham began looking into tips that said some law enforcement officers were not being held accountable the way regular people — you and I — might be. That’s key to a lot of Trusting News work: Understand your audience well enough to know what questions or complaints might arise, then get in front of it. This work doesn’t require columns from the editor. Social media posts and newsletters can be a great way to inject even just one sentence of mission and purpose into how a story is introduced. This idea was supported clearly in the social media experiments that launched Trusting News in 2016. Newsrooms tested ways to increase sharing of posts on Facebook with a specific eye toward learning what motivates people to pass on information. We called this strategy “Deploy Your Fans” and were trying to learn how to turn the people who already trust a news brand into promoters of that brand. When we asked users to share a story because it was a compelling story, because we’d worked hard on it or because we wanted more people to see it, it typically fell flat. When we asked users to share a Facebook post because the information contained was in the public interest, they responded positively. This was true across topics, whether the post would help their friends live their lives, would shine a spotlight on something good happening in the community, would protect people from a danger or would find homes for adoptable pets. For Trusting News partner newsrooms, links traveled far and wide when people felt like the focus was on utility and service to the public. Sometimes it was a matter of the post’s framing. Rather than asking people to share your really great story, ask them to make sure their friends know about this very important information. Take a look at some examples. Here are sets of successful Facebook posts from two newsrooms that did this especially well, the Enid News & Eagle and the Fresno Bee. Then check out this Fresno post that received more than 3,500 shares. Think how many new people were exposed to the Bee’s public service mission through this post. The trust-building language turned this story from a simple day turn about a food recall into public service information that was helping keep the community healthy and safe. So, storytellers, what are we doing as an industry to educate people about our mission? If you’re in the business of public service, we at Trusting News implore you to start telling that story. The Trusting News project, staffed by Joy Mayer and Lynn Walsh, is designed to demystify the issue of trust in journalism. We research how people decide what news is credible, then turn that knowledge into actionable strategies for journalists. We’re funded by the Reynolds Journalism Institute, the Knight Foundation and Democracy Fund.